Gambi picks up fruit from a street stall. A car drives up next to him and begins shooting a machine gun. His car veers off the road and explodes. Anissa volunteers at the Freeland clinic. Jennifer is doing a test on her computer for her online school. Khalil texts her and a flashback shows them chatting at the high school. Their chat is light and easy. Anissa tends to a patient at the clinic. The pregnant woman is worried about being a mother; her partner is worried and he lashes out at Anissa. Tobias and Painkiller kidnap Councilman Parker. The Councilman had accepted money from Procter for his reelection campaign; Tobias uses this to make him work for him. Deputy Chief Henderson tells Jefferson that Gambi died in the car accident. Anissa and Jefferson agree to never tell Henderson that Gambi was involved with Black Lightning. Jefferson doesn't think Gambi is dead until he sees the body. Lynn has discovered a cure for the green light powers, but it has a 50% mortality rate. Dr. Jace wants to run trials; Lynn refuses to start. Jennifer cries over losing Gambi. Anissa visits Grace to share her feelings; they hookup in her apartment. Grace regrets sleeping with Anissa because she didn't want to be used again. She gives Anissa an ultimatum to stay away if she plans to hurt her again. Grace's skin starts to react and change. She takes a pill for it to stop. Lynn and Jennifer visit Gambi's home to find a pocketwatch for Jefferson. Jefferson is mad to get the watch; he brings it back to the apartment. Councilman Parker announces that a private donor will pay for the clinic to be relocated from the community. Jefferson, while drunk, punches a guy who manhandles a woman in a bar. Khalil paid the reporter to mention the source about Tobias paying for the move. Tobias tells Khalil a parable about killing a weaker person; he insinuates that he will kill Khalil if he fails again. Deacon, the boyfriend of the pregnant woman, barges into the clinic and dies. Dr, Jace comes up with a theory to apply the vaccine to all the kids in the pod together instead of individually. 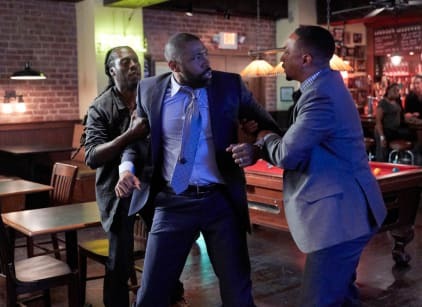 Black Lightning interrogates the owner of the bar about Gambi's murder. He thinks the Government did it and that Gambi died. Silver liquid pours from Deacon's dead body. Khalil visits Jennifer to check on her after Gambi's death. Jefferson cries in the tailor shop; he's distraught over Gambi's death. Dr. Jace and Lynn apply the vaccine to the pods, but people start dying. Dr. Jace lied about the simulation to force experiment. Fourteen kids in the pods died while the others survived. Anissa drives to South Freeland to see Aniyah, but she's pulled over by the sheriff. Strange liquid start moving inside his face, and things flash fast in the distance. Anissa drives away.